Can You Reheat Paella? | Can You Reheat? Q: I have leftover paella from dinner the other night. Can you reheat paella? What’s the best method of reheating paella? A: If your paella contains seafood, you should only reheat it within a day or so of its initial preparation. Seafood can go bad very quickly. Paella made with chicken and/or chorizo sausage can last a little longer. All paella can be reheated by various methods. How to reheat paella really depends on how much time you have. The microwave is the fastest method for reheating paella. Spray a microwave-safe bowl or plate with cooking spray. Evenly distribute the paella in the bowl or on the plate. Heat for 1 minute, then check temperature. If it’s not hot enough, rotate the dish and continue to heat in 30 second increments until it’s hot. If there are chicken pieces in the paella, you’ll want to reheat them separately. Put chicken pieces on a separate plate, heat for 2 minutes, and check temperature. Continue heating in 30 second increments until hot. Reheating in the oven will take longer, but may be the best method for preserving flavor, texture, and moisture. 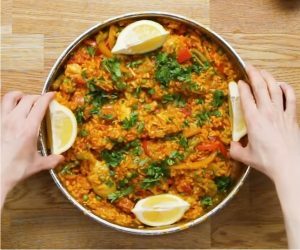 Put paella in an oven-proof container (a casserole dish that allows you to spread it in a thinner layer will help it cook faster). Add water (half a cup to a cup per 2 cups of paella, approximately) and stir through – you don’t want the paella floating in water, but you do want to keep it moist and this will help steam it a bit. Cover tightly with foil. Heat at 350 for 20-25 minutes or until hot. Stir about halfway through. If there’s chicken, you’ll want to cook it separately. Place chicken in separate pan, add a small amount of water, and cover with foil. Cook alongside paella until hot. The skillet method is faster than the oven, but not quite as quick as the microwave. It will preserve some more flavor. Separate sausage, seafood, and/or chicken from rice. Chicken should be reheated in the oven (place in pan, add water, cover with foil, put in oven at 250 for 20-30 minutes). Heat a skillet over moderate heat, add olive oil and heat until oil is shimmering. Add sausage and cook for 2 minutes. Add rice and cook like you’re browning fried rice. When done, add seafood, cover in hot rice, and let sit for 1 minute to heat seafood. Steaming paella is a quick and easy way to reheat paella while maintaining it’s moisture level and flavor. It’s best done in a bamboo steamer. Put paella on a plate. Place plate on top tier of bamboo steamer and cover for about 8 minutes. As with other methods, large chicken pieces should be removed and heated separately. When asking can paella be reheated, it’s important to remember that traditional paella contains seafood (shrimp, mussels, etc.). Seafood that is not properly cooked or thoroughly reheated can make you ill. It’s critical that, whatever method you choose for reheating, you make sure that any seafood is completely and thoroughly reheated. It’s also important that you not eat seafood more than a day or two after it was originally cooked, to prevent eating seafood that has turned. Many people think reheated paella tastes even better than the first time around. Also, there are many who claim that eating paella cold or at room temperature also tastes delicious, but this is not recommended due to the possibility of the seafood going bad.